Our passion is making our guests feel comfortable and connected in the northern Alaskan forest that we call home. We are a small-scale, family-run business focused on providing authentic experiences for our guests. We use hand-crafted gear, well-loved Alaskan Husky sled dogs, and experienced guides to create unforgettable adventures. Join us for single or multi-day adventures dog sledding, skiing, and snowshoeing. Hop on our dogsled and experience the joy of gliding across snowy trails and frozen rivers behind a team of friendly Alaskan Huskies! You can ride sitting in the sled and standing on the runners. Instruction, warm clothes, snacks and tea included. Trips are personal, we take only one party at a time. 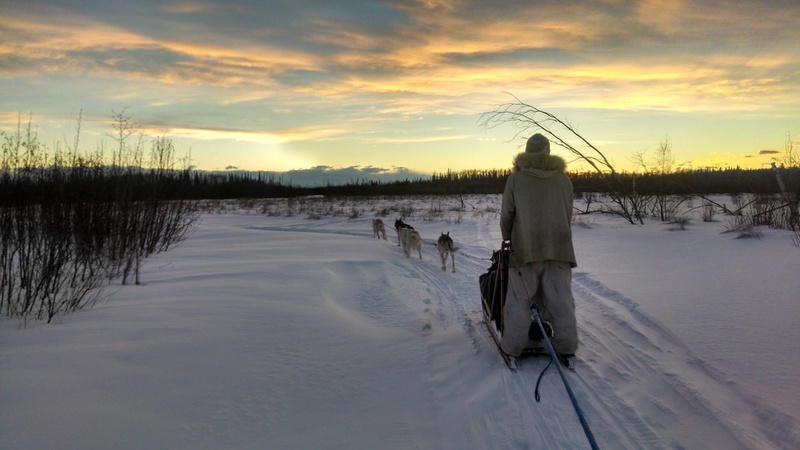 Choose from 2-hour or all-day dogsled adventures in Fairbanks. Gliding through a winter wonderland to the thud of paws on snow and scrape of sled runners on ice is an unforgettable experience. Our expedition trips are designed to take you far beyond the typical dogsled tour and into the world of a traveling musher. By day we explore by dogsled, snowshoe and ski and at night we retire to a cabin or heated winter tent. Experience a real Alaskan homestead. 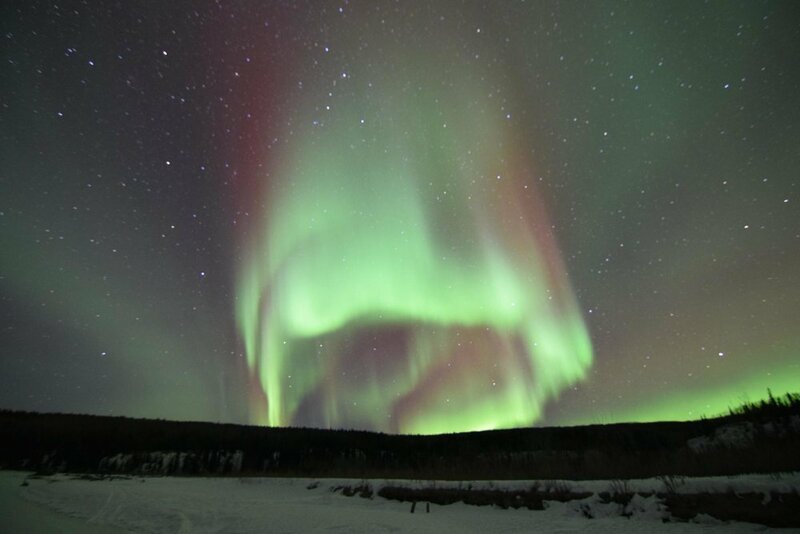 We offer customized stays at our cabin on a bluff overlooking the Tanana River. Spend your days mushing a dog team along the river, snowshoeing along a sunny bluff, ice fishing, carving a wooden spoon, and enjoying the sunset by an open fire and waiting for the northern lights. This combination trip is our best value and most popular! 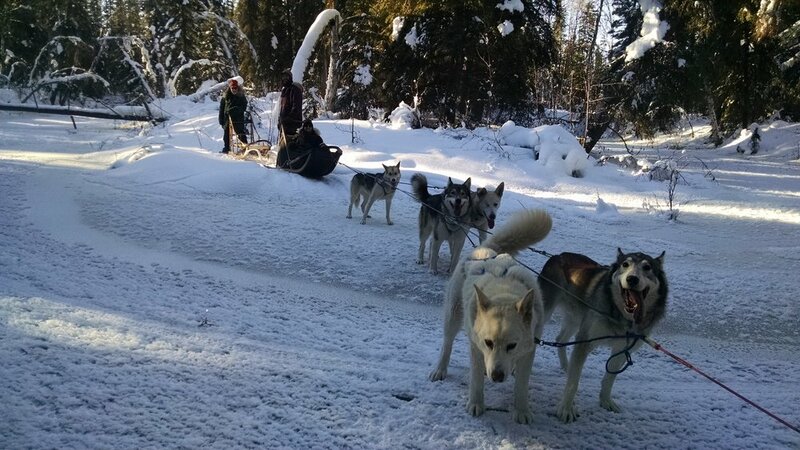 Why choose Boreal Journeys for your dog mushing experience? Personal- We only take one party at a time (generally of 2 people), ensuring that we have lots of time for YOU, your questions and your interests. This makes a big difference. Hear it from our past guests on our reviews page. Happy Dogs-We run 60-100lb Alaskan Huskies, the kind of dogs that have been used for over a hundred years in Alaska. Meet them on our dog page! We feed them a 90% salmon diet and catch the fish ourselves each fall. We keep our dogs : people ratio around 5 : 1 to ensure that the dogs have a high quality of life and lots of attention. Learn more about our commitment to dog care on our values page. 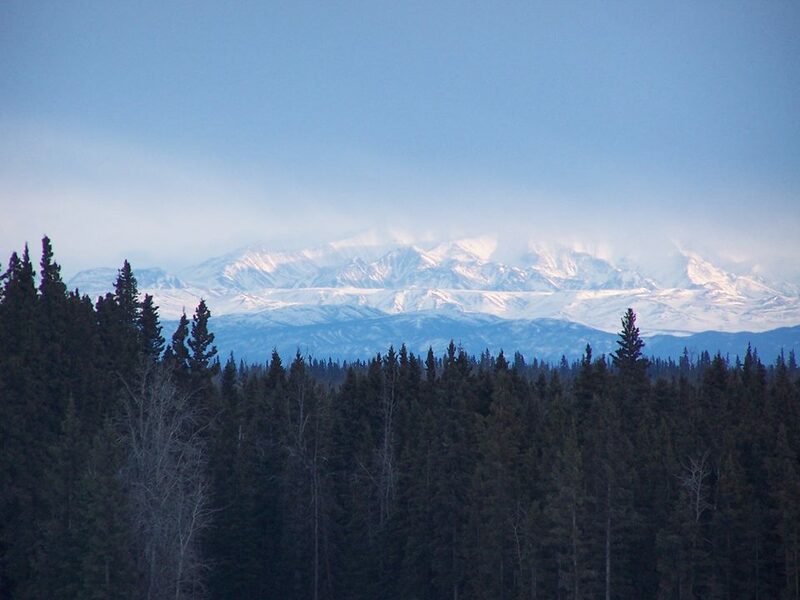 Less Driving- We are located 20 minutes from most Fairbanks locations and offer transportation, so you can spend more time in a dogsled and less in a car. We also offer pickup service from Fairbanks locations. Small Business- We are a two-person family run operation working out of our home. When you call you talk to an owner, when you go on a dogsled tour your guide will be an owner. Learn about the owners on the guides page. No Rush- We leave plenty of space in between our tours so the dogs can rest and you can enjoy a hot drink in our cabin, with plenty of time to talk. 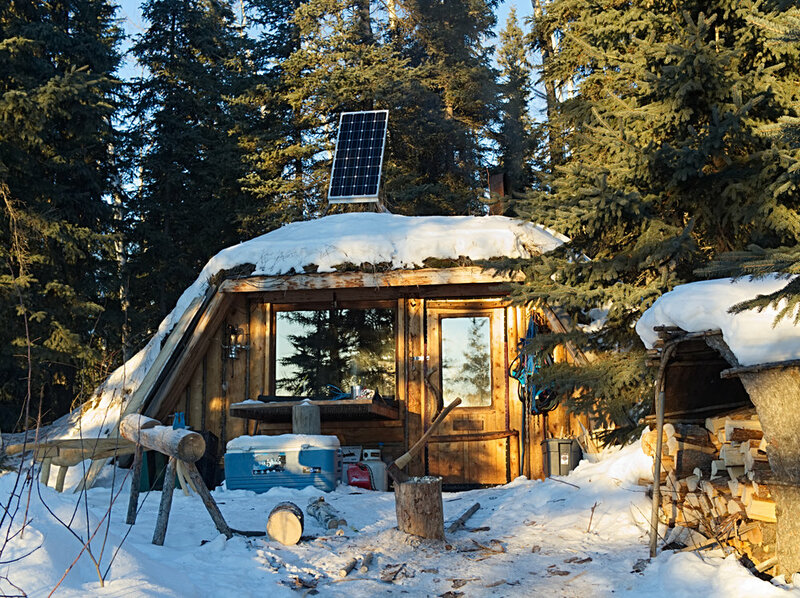 Cabin Lifestyle and Gear- We have guests get ready in our off the grid cabin where we chop ice for water, heat with wood, and build our sleds and clothing by hand. We are happy to share this lifestyle with you. Contact us today to learn more and reserve your adventure!